“But, I am trying to hire for attitude. You can’t see attitude,” Jena protested. Jena stopped. “Okay, I like those questions,” she said. Amazon has inched up the price of Hiring Talent, but it is still on promotion. Get it now, before it goes back to list price. This entry was posted in Hiring Talent and tagged attitude, candidate, hire for attitude, hiring talent, interview, interview for attitude, manager on May 16, 2013 by Tom Foster. “Roger, the reason we are having this conversation is that I don’t believe your accountability on this project is clear. As the manager on the Phoenix project, you are accountable for the output of your team. You have been working with this project team for more than two years. You are accountable for who is on the team and off the team. You are accountable for monitoring the pace and quality of the team’s output. You are accountable for the work environment.” I stopped, so Roger could catch his breath. “I know, I know I am accountable. But, if I have team members who are slow walking the job? I mean, I set the example. I am here early. I stay late. I’m engaged,” Roger defended. “So, let’s say the pace is not meeting what the client expects, or what you expect, as the manager. What could be happening?” I asked. Roger’s eyes flew to the ceiling, searching for answers in the back of his brain. His head began to nod. “Could be an attitude problem. Or, could be that the expectations are out of line. Could be that the work instructions aren’t clear. Maybe the training wasn’t effective. Maybe we don’t have the right tools available. I could see a clearer understanding infecting Roger’s take on the problem. “So, I expect to see this list written. Then some analysis, which are you going to tackle first? What steps will you take, as the manager, to inspect the work instructions, check out the traininig, look at the work layout. This entry was posted in Accountability and tagged accountability, attitude, expectations, tools, work instructions, work layout on June 29, 2012 by Tom Foster. “I don’t think you have an attitude problem. I don’t think you have clearly defined the accountability and the authority that goes along with that dotted line. That’s why dotted lines are so dangerous,” I said. “So, what should I do? This Key Result Area is not a high priority, but the work still has to get done,” Megan explained. “You are shooting yourself in the foot when you describe -it’s not a high priority-. If the work in this area is not done, what happens to its priority?” I asked. “So, what should you do with that dotted line?” I pressed. This entry was posted in Accountability, Organization Structure, Time Span and tagged accountability, attitude, manager, role, role description on May 21, 2012 by Tom Foster. It’s been a whirlwind of a week. I would like to welcome our new subscribers from workshops in Minneapolis, Des Moines and Austin. “So, there is a conflict in her priorities?” I asked. “As her manager, what do you observe about the way she handles the conflict in her priorities?” I pressed. “I thought it was just a dotted line?” I smiled. 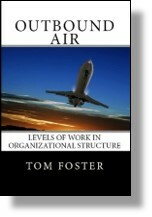 This entry was posted in Accountability, Organization Structure, Time Span and tagged accountability, attitude, conflict, dotted line, management, manager, org chart, priority on May 18, 2012 by Tom Foster. Sara’s eyes narrowed. I continued. “So, what question would you ask?” I pressed. The next group in our Hiring Talent program starts next Monday. To join the group, follow this link to pre-register. This entry was posted in Hiring Talent and tagged attitude, behavior, hiring, interview, interviewing, management, manager, talent, values on March 16, 2012 by Tom Foster.